Today I found out what causes the “sleep” or “eye crusties” you may have around your eyes in the morning. “Sleep” is a type of “rheum”, which is the name for discharge from your nose, mouth or eyes during sleep. More specifically, eye rheum is known as “gound”. Gound is made up of a mixture of dust, blood cells, skin cells, etc. mixed with mucus secreted by the conjunctiva, as well as an oily substance from the meibomian glands. The meibomian glands are a type of sebaceous gland that line the rim of the eyelids with about fifty on the top and twenty five on the bottom of each eye. They secrete an oily substance called meibum that performs a variety of functions including: helps seal your eyes in an air tight fashion when they are closed; prevents tears from spilling onto your cheeks; and helps keep tears that coat your eyes from evaporating. It is this oily substance that is one of the primary components in gound, mixed with mucin from the conjunctiva and various foreign particles in your eye. Normally, when you are awake, the gound is naturally washed away via tears and the blinking motion. 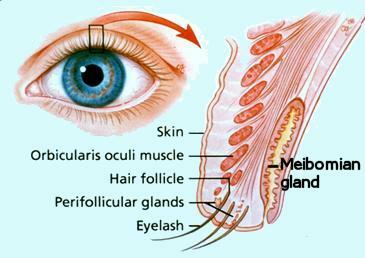 However, as you sleep, you obviously don’t blink so the meibomian secretions and other components of the gound tend to gather in the corners of your eyes, as well as along your eye lines and dries out, creating hard yellow-ish “eye boogers”. The round pinkish area on the inner part of the eye is actually made up of two distinct parts, the caruncula lachrymalis, which is the bulging section that secretes tears, and the plica semilunaris, which is the crescent moon-shaped part that is thought to be a remnant of a “third eyelid” often seen in birds and certain other animals, making it a vestigial organ. For most people, gound isn’t a big deal. However, for some with overactive glands or underachieving tear ducts, the gound can actually cause the eye to be sealed shut. The best way to “un-glue” eyes sealed shut by gound is to take warm water and wet a washcloth and then gently wash the eyes until you are able to open them. Alternatively, you can take a cotton ball and soak it in warm water mixed with a small amount of salt (a teaspoon or so) and rub it along the area that’s sealed shut by the gound. Next, you can use a cotton swab to carefully remove the remaining gound from your eye lids. If you can manage to get to the shower, you can also simply just allow the steam and the hot water to naturally moisten the gound until you are able to open your eyes. Why, those things are eye-buggers! Everbody knows that!! !